Google’s new Ebola proof tablet rolled out! 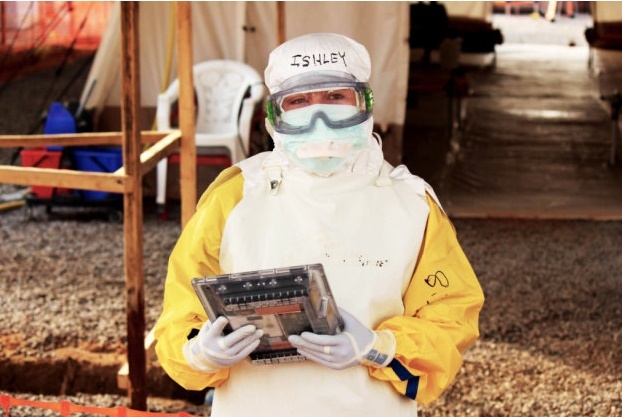 Google has extended its wings by developing an Ebola proof tablet that can survive being doused in chlorine and can be used while wearing gloves and technology volunteers for use by health workers in Sierra Leone. Ebola is on rampant in West Africa and there is a scare of its spread around the world. Fortunately, in Sierra Leone, health workers are utilizing technology to help them stop the spread of the disease and also create a more efficient work place. While the Sony Xperia Android tablet being used is not a custom creation, the tablet is fortified by a unique protective casing. The Android device, based in a waterproof Sony Xperia with an extra protective casing, allows medics to safely record and share patient temperatures and symptoms over days and weeks. It is claimed that it can withstand the storms and high humidity that are commonplace in the Ebola zone of West Africa with the help of special casing. Its sharp edges have been removed so there is no risk of piercing the protective clothing health workers wear, and it can be charged quickly and wirelessly by being placed on a table. While we have seen rugged casings before, the special casing being used in Sierra Leone takes it a step further by allowing the tablet to withstand storms and high humidity environments that are common in West Africa. The case also has rounded edges that prevent accidental punctures of protective clothing that health workers are required to wear. Not only can the tablet withstand storms and humidity, it can also resist being sanitized in a chlorine bath. Furthermore, the tablet is fully capable of registering touch even when being used with gloves. Lastly, as an added convenience, the tablet can remain in its protective casing at all times due to its ability to be charged wirelessly. This unique tablet was designed after a Medecins Sans Frontieres doctor working in the organization’s treatment centre told his colleague in London he was being forced to shout patient details over a fence from inside the protective zone where medics must be fully covered to avoid catching the deadly disease, since even passing a piece of paper to the outside could risk transmitting it.